SAL DeTRAGLIA'S VIRTUAL TAPAS BAR: DULLARDS WITHOUT BORDERS. I thought I could escape Bryan Adams by moving to Spain. I was wrong. It’s nothing personal against the man. I’m sure he’s a swell guy who treats his mother like a queen and makes generous donations to his local animal shelter. You’re the only girl for me. I’d really, really, really, really, really, really die for you. Do you see what I mean? Not quite in the same league as Lennon's and McCartney’s All You Need Is Love. To be honest, I’m not even sure it’s in the same league as that Gary Glitter song that’s played during basketball game intermissions. Yet even in Spain, Bryan Adams’s music won’t go away. There is a nation-wide radio franchise called KISS-FM. Its music format is a relentless gush of saccharine-sweet ‘80’s pop—punctuated with a large dollop of Bryan Adams every fifteen to twenty minutes. Honestly! KISS-FM is extremely popular in Spain. But worse yet, it’s extremely popular with all the wrong people—such as Mrs. Virtual Tapas Bar, my neighbor Jesús (who, lamentably, has wired his back patio with outdoor loud speakers) and every taxi driver with whom I’ve ridden since 1999. Despite KISS-FM’s troubling ubiquity, I’d remained hopeful. I kept reminding myself of one important fact—Bryan Adam had not released an album since 1999. Could it be that he had retired from the limelight? Would he soon join the likes of Boy George and Ginger Spice on the scrap-pile of music has-beens? 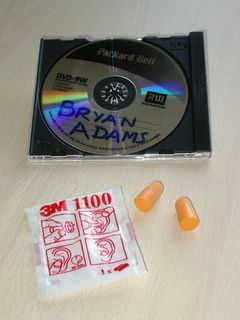 My hopes were dashed last week, when I learned that Bryan Adams had just released a new album. Its first single—creatively entitled, Flying—is already receiving airplay on KISS-FM. I heard it yesterday for the first time. And what did I think? How ironic life can be. I once believed that Canada’s cheesiest musical export was Gordon Lightfoot. Now I miss him. I really, really, really, really, really, really miss him. Sal: Even in my Painting Studio my colleagues do their work under the inspiration of KISSSSS...FM. When I arrive I turn to 96.5 FM Classical. That's why my paintings are...differents? Indeed! Your paintings show taste, class and talent. These are three traits wholly absent from KISS FM. BTW, you latest work is now framed and hanging in our living room. It looks great.